(Newser) – A 75-year-old man received bad news after being admitted to Aarhus University Hospital in Denmark last week, but his nurse did what she could to make his final hours good ones. Carsten Flemming Hansen was suffering from a ruptured aortic aneurysm, and doctors told him he was too sick to have surgery—meaning the internal bleeding would kill him within days, perhaps even hours. 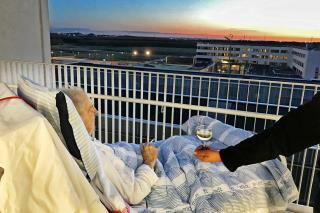 Hansen told nurse Rikke Kvist that he wished he could have one last cigarette and glass of wine. The hospital has a no-smoking policy, but Kvist got around it. Yeah, a study in euthanasia by neglect. Socialized medicine on full display. A perfectly treatable injury, with either a mesh or a stent and this man would have 10 to 20 more years to live. But where the state decides what care you get, hey knock him off there are plenty where he came from. It's just Logan's Run.